Snooker table game rules, rule books? 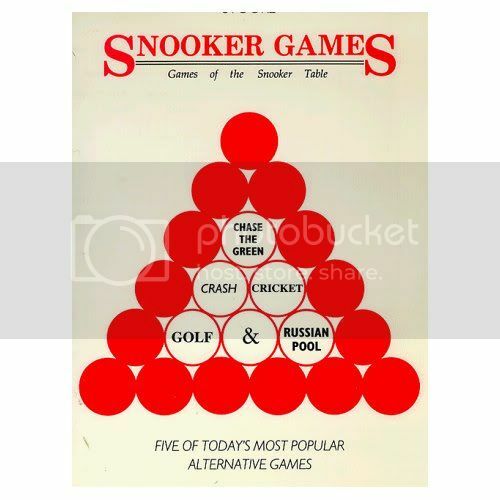 Does anyone know some different Snooker game rules or possibly books with different Snooker games? This looks like a good book, but only 5 games. Anyone in the U.K. or where ever with some nice Snooker rule books willing to sell me some? I have paypal? Liability is a fun game if you have several players for a ring game. You don't have to play with the full rack of reds (6 reds is good, for example). Pull peas to determine order before each game. You play for so much a point with the reds being one point and the colors whatever number it is. You get paid by the guy before you who sells out to you and you pay the guy after you that you sell out to. You can also pull peas so each player has a "secret number" that comes into play after the reds are gone. When the reds are gone you collect a predetermined amount for every color you sink from whoever has that color. For pocketing your own number you collect so much from EACH player. Someone sinks yours and you pay him. This is in addition to the player that sold out who also has a "liability" to the shooter. Thanks! If anyone knows of other games, please post! Does anyone know the rules for Crash? Anyone know anymore Snooker or English billiard games? Anyone know any good books with a lot of rule for Snooker/English billiard variations to play? lol I think I should try to get my own rule book published. BCA only list 30+ games in their book and each time they put new games in, they take out older ones. Their book is nice, but they neglect a lot of fun games to play. There are no good books on Snooker that I know of in the U.S. Usually the ones that have Snooker in them, they stick to just the basic rules of the game. Does anyone know any other Snooker games? These are the rules to the game of Crash as I played it. •	To play you need a set of snooker balls and cards numbered 2-7. •	You can have up to 6 players playing, but under 3 is not as much fun. •	The object of the game is to sink your ball on a legal shot or to make 15 balls in a row (this way of winning is removable or changeable for a lower amount of balls i.e. 10, 12). can obviously be lower or higher. Once someone has made their colour legally or made 15 balls they have won, end of game, they win the pot! 1)	Everyone playing takes a card, keeps it and does not show it to anyone else (or tell anyone else what the number is). Each number represents one of the colour balls i.e. 2 – Yellow, 6 - Pink, etc. 2)	You then select the order. I find that youngest to oldest works well as there can be no arguments that way. 3)	To set the balls up you put the colours in order in a triangle with the yellow at the top (a ball under the pinks spot) and the others in order behind it. You then place all of the 15 reds around the pack or 6 colours. 4)	For the first game the youngest player breaks. I like to have the rule 1 ball must hit a rail, but no more than 4 or it loses its edge as a game. •	The cue ball must hit a red first for it to be a legal shot. •	You must pot a red and then you have the option of potting the colour closest to the cue ball (make sure your opponents have verified it is the closest ball before shooting) or you can play another red ball. After any red ball you can play the colour closest to the cue ball. •	You can only pot what colour you are aiming for i.e. if you are shooting a red ball you can only pot a red or it is a foul. If a colour goes in on an illegal shot (a red on to colour is an illegal shot), then the colour gets re-spotted on the black spot or just under it. •	If you are aiming for a ball and don’t hit it or hit the wrong colour first it is a foul. •	All ball fouls are included, so if you move a ball with any part of you, your clothing, cue, bridge or any other object other than a legal shot it is a foul. •	If you pot the cue ball it is a foul and the next person can place the cue ball only in the “D”. •	Once all of the reds are gone you then play the colours in order until they are all gone. •	You do not have to hit a rail for it to be a legal shot. I love Crash it is a great social game, that has tactics, some bluffing and requires skill to get the table in the position you want in order to win without selling out. I think that is all of the rules, but if someone remembers them differently, please chime in! Most of the non-official billiard table (there is no such thing as a snooker table) games have varying rules from region to region. They are almost invariably gambling games. The way we played crash was as follows. Using all the 21 balls form a triangle. The reds are at the outside of the triangle with the colours in any order, in the middle. Every player puts a sum (say $1) in the pot and and agreed amount (say 50c) is put on any foul. Six playing cards are required numbering 2-7, these correspond to the value of the colours. These are set FACE DOWN to the side. This is a rotation game ideally with 6 players and the rules regards fouls are the same as snooker. A player breaks and the rotation continues until a red is potted. That player then takes a card WHICH THEY KEEP A SECRET and that is "their colour". That player then shoots at another red. The winner of the game is the first player to pot a red followed by their colour. The great fun of the game is no-one knows what colour the other players are on. When you pot a red you do not need to shoot at your own colour you can pot another, then a red then a colour and so on. When an opponent pots your colour, you keep quiet and set about potting all the other colours to make it a double up game. The most important rule is EVERY COLOUR MUST BE NOMINATED. Failing to do so is a foul, many is the player I have seen with their ball over the pocket to tap in for the money and in the excitement forget to nominate. A great game for relatively small stakes with friends and beers and I GUARANTEE someone will forget to nominate. Apologies fast manners, I never saw you had posted. Black flag I would be very interested in your rules for slosh and skittles, I played these games many years ago but can't remember the details. Agreed it is a great game, you explained it more concisely than me. Did you play that you could only shoot the colour nearest the cue ball? as that is a key rule in the way that we played. Hi. We didn't play the nearest the ball rule and the reasons for that were twofold. Firstly we played with top pro players so getting their colour off meant it was great seeing them fight to get all the other colours. Secondly, because of the "nominate" rule, if guys have a choice they are more likely to forget which really is funny when the beers are flowing and it's an easy ball. I like your rules too. Sometimes we used to handicap guys by making them pot two reds for a shot at a colour.